All of the memories in these 10 years are really important to me, but for me, our work overseas left a great impression. You know, since there are people cheering on Berryz Kobo even in countries we haven't been to, that such a great number of people know about us...... It was quite astonishing. Shimizu Saki: Shimi-chan's helped me out lots♥ If there's something Miya doesn't like, I immediately get irritated and down in the dumps, but Shimi-chan gives me lots of advice to tide me through~. Sorry for worrying you countless countless times. Tsugunaga Momoko: Watching the competitive Momo from since we were small, it made me think that Miya should believe in herself too! 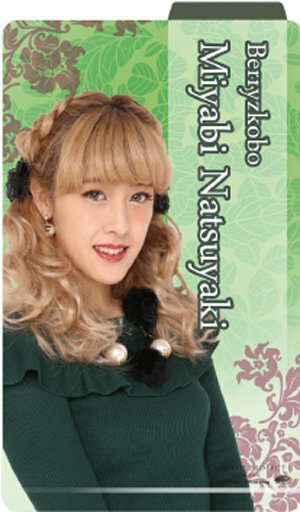 Sudo Maasa: Maa-chan is Berryz Kobo's mother!! Ever since we were small, Maa-chan's been a person of strong character, so I've been pampered by her a lot ~♥ Thankyou for associating with Miya even when I'm messing around! Sugaya Risako: Looking at Risako give mature opinions despite being younger than me, I always think that Risako's grown up to be a level-headed adult.